3100 - The Egyptians develop hieroglyphic writing. 2950 - Upper and Lower Egypt are united by Menes, the first Pharaoh of Egypt. 2700 - Papyrus is developed as a writing surface. 2600 - The first pyramid is built by the Pharaoh Djoser. Imhotep, the famous advisor, is the architect. 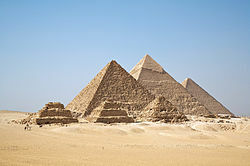 2500 - The Sphinx and the Great Pyramids of Giza are constructed. 1600 - The chariot is introduced. 1520 - Amhose I reunites Egypt and the New Kingdom period begins. 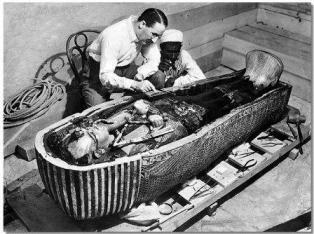 1500 - The pharaohs begin to be buried at the Valley of the Kings. 1479 - Hatshepsut becomes pharaoh. 1386 - Amenhotep III becomes pharaoh. Ancient Egypt reaches its peak and the Temple of Luxor is constructed. 1279 - Ramses II becomes pharaoh. He will rule for 67 years. 670 - The Assyrians invade and conquer Egypt. 525 - The Persian Empire conquers and rules Egypt. 332 - Alexander the Great conquers Egypt. He establishes the city of Alexandria. 305 - Ptolemy I, a general under Alexander the Great, becomes pharaoh. 30 - Cleopatra VII commits suicide. She is the last pharaoh of Egypt. Egypt comes under the rule of the Roman Empire. 395 - Egypt becomes part of the Byzantine Empire (the Eastern Roman Empire). 641 - The Arabs conquer Egypt and convert the land to Islam. 969 - The capital city is moved to Cairo. 1250 - The Mamluks take control of Egypt. 1517 - Egypt is conquered by the Ottoman Empire. 1798 - The French Empire, led by Napoleon Bonaparte, invade Egypt. However, Napoleon is soon defeated and the Ottoman Empire once again takes control. 1805 - Ottoman general Muhammad Ali becomes leader in Egypt. He establishes his own dynasty. 1869 - Construction on the Suez Canal is completed. 1882 - The British defeat Egypt at the Battle of Tel el-Kebir. The United Kingdom takes control of Egypt. 1914 - Egypt becomes an official protectorate of Egypt. 1922 - The United Kingdom recognizes Egypt as an independent country. Fuad I becomes King of Egypt. 1928 - The Muslim Brotherhood is founded. 1948 - Egypt joins a military coalition of Arab states including Jordan, Iraq, Syria, and Lebanon and attacks Israel. 1952 - The Egyptian Revolution occurs. Led by Muhammad Najib and Gamal Abdel Nasser the monarchy is overthrown and the Republic of Egypt is established. 1953 - Muhammad Najib becomes president. 1956 - Gamal Abdel Nasser becomes president. He will rule until 1970. 1956 - The Suez Crisis occurs when Nasser nationalizes the Suez Canal. Forces from Britain, France, and Israel invade. 1967 - Israel launches an attack against Egypt called the Six-Day War. Israel takes control of the Gaza Strip and the Sinai Peninsula. 1970 - Nasser dies. Anwar al-Sadat takes his place as president. 1970 - The construction is completed on the Aswan High Dam. 1971 - Egypt signs the Treaty of Friendship with the USSR. A new constitution is adopted naming the country the Arab Republic of Egypt. 1973 - The Yom Kippur War occurs when Egypt and Syria attack Israel on the Jewish holiday of Yom Kippur. 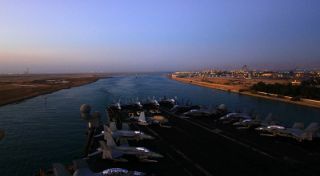 1975 - The Suez Canal is opened again after being closed since Six-Day War. 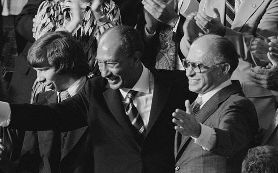 1978 - Anwar al-Sadat signs the Camp David Accords with Israel for peace. Egypt is kicked out of the Arab League. 1981 - Anwar al-Sadat is assassinated. Hosni Mubarak becomes president. 1989 - Egypt is admitted back into the Arab League. 2004 - Israeli tourists are killed by terrorist bombs on the Sinai Peninsula. 2011 - President Mubarak resigns and flees the country due to widespread violent protests. 2012 - Mohamed Morsi, candidate of the Muslim Brotherhood, is named president. However the election results are disputed. 2013 - After more violent protests, the military removes Morsi from the presidency and places the leader of the Supreme Court, Adly Mansour, as acting president. A state of emergency is declared and the Muslim Brotherhood is banned. One of the oldest and longest lasting civilizations in world history was developed in Ancient Egypt. Starting in about 3100 BC, Menes became the first Pharaoh uniting all of Ancient Egypt under one rule. The Pharaohs ruled the land for thousands of years building great monuments, pyramids, and temples that still survive to this day. The height of Ancient Egypt was in the time of the New Empire from 1500 to 1000 BC. In 525 BC the Persian Empire invaded Egypt taking over until the rise of Alexander the Great and the Greek Empire in 332 BC. Alexander moved the capital to Alexandria and put the Ptolemy dynasty in power. They would rule for around 300 years. Arab forces invaded Egypt in 641. Arab Sultanates were in power for many years until the Ottoman Empire arrived in the 1500s. They would remain in power until its power started to wane in the 1800s. In 1805, Mohammed Ali became Pasha of the country and founded a new dynasty of rule. Ali and his heirs would rule until 1952. During this time the Suez Canal was completed as well as the building up of the modern city of Cairo. For some years between 1882 and 1922, the Ali dynasty was a puppet of the British Empire while the country was part of the British Empire. In 1952, Egypt the monarchy was overthrown and the Republic of Egypt was established. One of the main leaders, Abdel Nasser came into power. Nasser took control of the Suez Canal and became a leader in the Arab world. When Nasser died, Anwar Sadat was elected President. Prior to Sadat becoming president, Egypt and Israel had fought several wars. In 1978, Sadat signed the Camp David accords which led to a peace treaty between Egypt and Israel.